A good tow truck company can be hard to find. If your vehicle breaks down on the side of the road or you become involved in a car accident, you want a towing company that will provide fast and efficient service. Unfortunately, not all tow truck businesses are honest and reliable. To find a good local towing company, follow these important tips. Word of mouth is an excellent way to find a good towing company. If someone that you know and trust recommends a certain towing company, you can usually confirm that you going to receive satisfactory service. You can also check for reviews online to see the experience of other customers who have used the company’s service in the past. 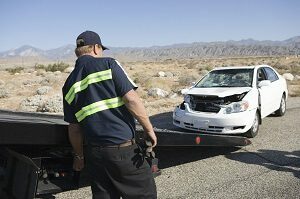 When shopping around for tow truck companies, make sure that the company you choose is licensed and insured. A professional towing company should be registered with the state and possess a license number. If a towing company is working without a license stay away. You do not want to be held liable in the event of an accident or damage done to your vehicle. While you can’t always determine how fast a tow truck company will react until you’re face to face with a problem, you can ask for an average estimate. When interviewing a tow truck company for their services, ask how long it usually takes to arrive to the scene. Once on site, how long does it typically take for the technician to prepare your vehicle to be towed? By asking these types of questions you can be better prepared if you should ever need a tow truck. When choosing a tow truck company, opt for a business that has several years of experience. Experienced tow truck companies will have extensive knowledge of how to tow a vehicle without causing damage and will understand how to get the job done as fast and efficiently as possible. Local tow truck companies will also have knowledge of the area to ensure that you are found quickly wherever you may wind up. While having a designated tow truck company can be handy, it is often more convenient to work with a towing company that offers multiple services. In addition to towing your broken down vehicle, some tow truck companies can also provide other services, such as roadside assistance. Have a flat tire? Run out of gas on the side of the road? A roadside assistance technician can travel to wherever you are to remedy the problem. You just never know when you’re going to need a tow truck company to get you out of a bind. Before you experience your next catastrophe, be sure to have a reliable towing company saved in your contact list. A bad situation can become much worse unless you have a professional on your side. Hey great information here, no one wants to put their second most valuable asset in the hands of an inexperienced or uninsured tow company. My car is like my baby so, I do not think I would just trust it with anyone. Thanks for the information you provided, I am sure that I will make the right choice and ask the right questions in any future towing situations. Great information on this post. I know if I broke down, or my wife or family member then we would want somebody who was trusted and ethical. The last thing you need when you’re feeling vulnerable is some uninsured or inexperienced creepy guy turning up. Also, like you say it’s great to know one that could fix a tyre at the roadside for you, or bring a can of fuel if you run out rather than just hooking your car up and towing it away. Sure, it might cost a little more, but better that and having the confidence to know somebody trustworthy is going to turn up. I hear that Australia has just this week announced that they plan to regulate their towing industry. Too many cowboys holding cars ransom for ridiculous amounts of money. I have always been lucky when calling on towies, but it can be pretty hit and miss at the best of times. Maybe the grumpy old man razor sharp attitude of not taking prisoners and treading on people finally pays off. I agree that references are important when choosing a good towing service. It would be good to consider what others have to say in order to ensure that they are well liked by their past clients. My husband and I are looking for a towing service, so we’ll have to consider their references first. My car is pretty old, and I’m worried it could break down at any time on the road, so I want to find a good tow company to call in case this happens. Your article had some great tips for choosing a towing company, and I liked how you said to choose a company that has several years of experience so they know how to tow your vehicle without damaging it. Thanks; I’ll keep this in mind when choosing the tow company best for my needs. Thank you for this good post! I just heard a story how my friend had to order towing services and I realized that I don’t have any number to call in case my car needs towing. I need to find a reliable towing company so these tips are very useful for me. It would indeed be a good idea to choose a company which has multiple services. Thank you again! I appreciate the tip you gave about making sure the company is licensed and insured when looking for a towing service. Accidents are so unexpected, so it’s a good idea to find a reliable towing service to work with in the future. If I were to get into an accident resulting in the immobilization of my car, I would hire a reputable towing service as fast as I could. I’ve never thought of asking for an estimation of how long it will take the company to respond to your emergency. This is something I’ll have to keep in mind as I search for the right towing company to come and remove a car from the front of my house. I’ll have to do some research and find the best towing company in my area. I agree that you want to make sure to find a licensed and insured towing service. It would make sense to find someone who is licensed in order to know they are qualified. My husband and I are looking for a towing service, so we’ll have to check their license. I liked your suggestion to ask family and friends for references. My husband and I have become a little more worried about my car since it’s older and tends to have more problems than his. It would be great to have someone on call that was recommended by friends and family so that we have someone we can trust to help us when we run into any issues with our car. Thanks for the great tips for choosing a towing company. We want to find a good one in our new area because my son is just learning to drive. I’ll remember what you said about asking the company about their licenses and insurance, like you said. That’ll be good to make sure of. I really appreciate your tip to find a towing company with the right insurance so you won’t be held liable. My wife and I have been thinking of getting our son a car for his birthday, and we know that he likes to go on long road trips. If something goes wrong on one of his trips, I will be sure to find a towing company for him that is properly insured! My wife and I try to keep a towing company in our emergency contacts at all times just to be safe. You make a great point about always verifying the company’s licensing and insurance though. I would never want to be liable for any injuries or damages that might happen so this is some great advice. I like that you pointed out how an experienced company will assure me that my vehicle will not get further damage. I will definitely choose a reliable one to tow my vehicle which I left in the grocery store’s parking. This is because it overheated yesterday and was not able to start after I waited for an hour to cool it down. I agree that you want to find a towing service that is experienced. It would make sense to find someone who is qualified and experienced in order to know they will do good work. My husband and I are looking for a towing service, so we’ll have to check their past experience first. You really do want to make sure that you’re working with an established towing company before you hire them. After all, you will be relying on them to transport your car back to the shop or your home. Because of this you will want to be able to rely on them to get your car there safely and this is easier with an established towing company. My little brother’s car is in pretty bad shape and may need to be towed to a mechanic. Of course, this means we’ll need a great towing service to help us. It was helpful when you mentioned that one should make sure that the towing service they hire is registered with the state and has a license, as this will show that they are a legitimate service. Thanks so much for all the great tips on what to look for in a towing service.